Sudoku rules are easy to learn. Sudoku puzzles vary in difficulty from simple to devious. Puzzles have a unique solution that can be arrived at using pure logic. No guessing is required. 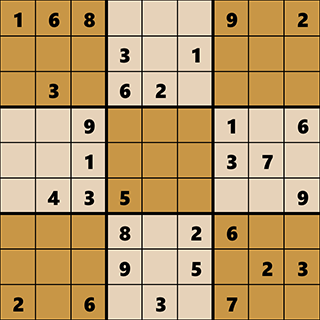 Sudoku is not a math game, but is rather about identifying logical patterns. Complex strategies must be utilized in order to solve the hardest puzzles. 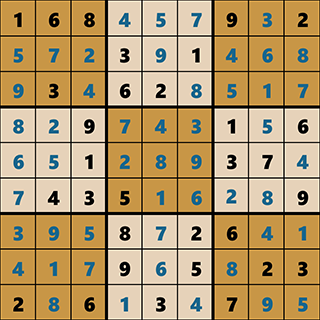 This is a typical sudoku puzzle as it is presented to the player. 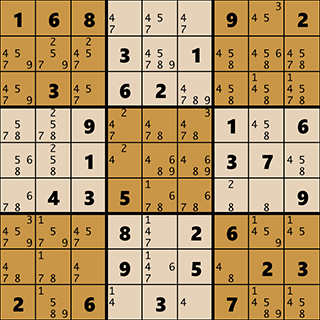 The goal of sudoku is simple: fill in the numbers 1-9 exactly once in every row, column, and 3x3 region. For example, look at the above puzzle and compare it to the solved version below. Notice that every row, column and 3x3 region contain every number from 1-9 exactly once. The same puzzle, this time solved. It is typical to use notes (also called mark-ups) to plot in possible numbers. The image below shows these notes, indicated by the small numbers. For example, look at the very last cell (the lower, right). 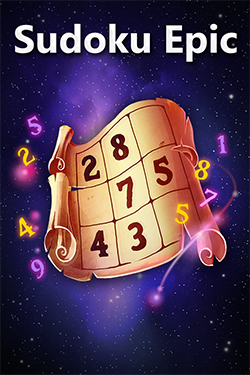 The player has determined that only the numbers 1, 4, 5 or 8 can be placed in that cell, and has thus put these numbers in as temporary notes. The small numbers indicate "notes" made by the player. You now know enough to start solving sudoku puzzles! But you may want to learn more about the different strategies involved in solving harder puzzles. For an in depth look check out this Sudoku solving tips page. Sudoku Epic supports four game modes: regular Sudoku, Mini-Sudoku, Wordoku and Killer Sudoku. It is available on most platforms: PC, Mac, iPhone, iPad, Android, Google Play Store, Windows Phone, Amazon Appstore, Blackberry and more! You can also play Sudoku on Facebook.